BU’s newest recruit comes with an NHL pedigree, and, according to several sources, a “laser” of a shot. 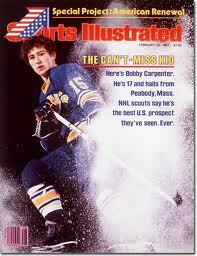 16 year old Bobo Carpenter is the son of Bobby Carpenter, a one-time first round NHL draft choice, the first American-born player to scored 50 goals in an NHL season and the first U.S. hockey player featured on the cover of Sports Illustrated--with the headline "The Can't Miss Kid," no less. A sophomore at Austin Prep, the 5-10, 185 lb. right-shot center from North Reading was second in team scoring (one point behind the leader) with a 16-14-30 scoring line in 24 games. He helped lead the Cougars to the 2013 Super 8 championship game at TD Garden, where they lost to Malden Catholic, after assisting on the game winning goal in the semifinal that eliminated his father’s alma mater, St. John’s Prep. 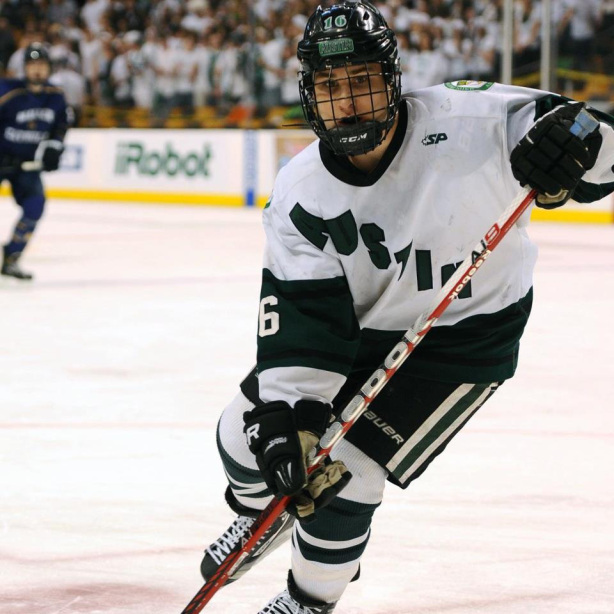 According to The Boston Hockey Blog, the soonest he’d arrive at BU is for the 2015-16 season. Other pursuers included Boston College, New Hampshire and Providence College. Carpenter’s sister, Alex, a sophomore at BC, led Hockey East in scoring and earned All-America honors this past season. CNH reporter and editor of The Mack Report Mike McMahon, who tweeted about Carpenter’s verbal earlier today, also added in a tweet, “Carpenter, from what I saw, had one of the quickest releases I saw last year ... HEA included, not just HS hockey. He has a laser." Austin Prep Head Coach Louis Finocchiaro recently told the Eagle Tribune that “"Bobo’s relentless...He’s got one of the hardest shots I’ve seen from a schoolboy." "His work ethic is phenomenal. His positiveness on the ice, off the ice, in the locker room is impeccable ... He is a phenomenal hockey player. [Quinn] is going to be extremely, extremely happy with his choice of Bobo Carpenter when it is all said and done. I think he has got a diamond in the rough." Prior to Austin Prep’s winter season, Carpenter played for the Middlesex Islanders U18s in the New England Prep League. Evaluating the league’s top players, USHR wrote: “Good bloodlines, we’d say. Bobo can really fire the puck. Plays with a lot of energy and is as tenacious as they come." ►Rising senior defenseman Garrett Noonan talked with WTBU Sports about his goals for next year, his decision to return for his senior season and his relationship with now-retired Coach Jack Parker. ►Thanks to the blog reader who points out that former Terrier Adam Clendening was recalled to Chicago for the Stanley Cup playoffs following a standout rookie season at AHL Rockford. The blueliner earned second team All-AHL honors after putting up nine goals and 37 assists. The 37 assists and his 46 points both established new records for first-year IceDogs.